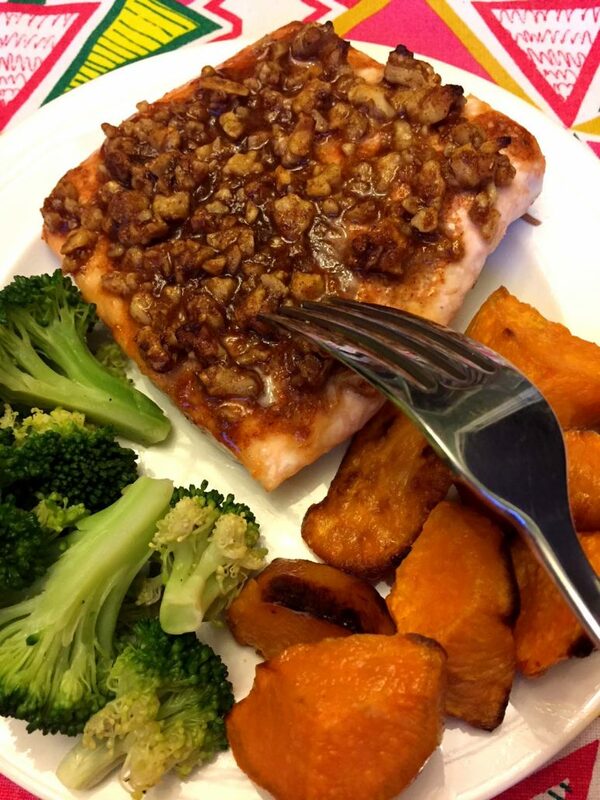 This gorgeous walnut crusted salmon is mouthwatering! Bite into this succulent salmon and taste the crunchy walnuts and the sweet & spicy coating! 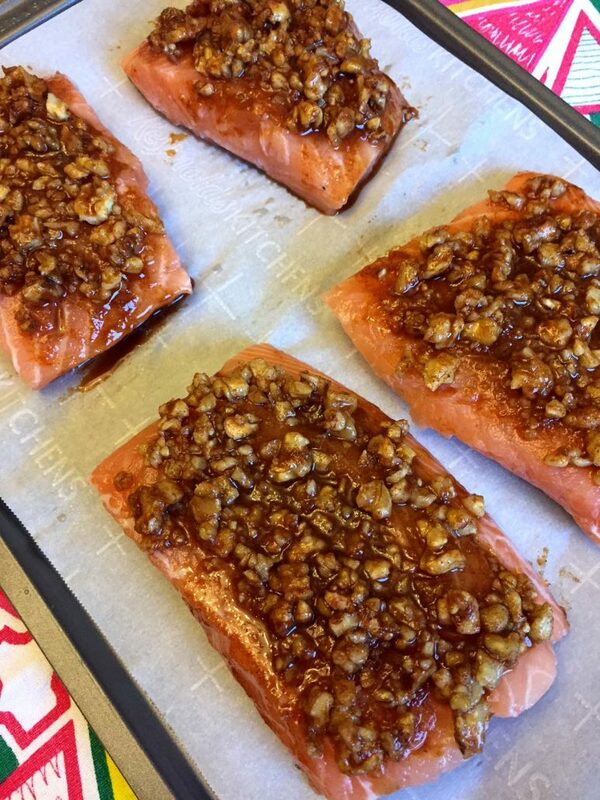 This baked salmon looks really impressive with the coating of chopped walnuts, maple syrup and spice. And it tastes as good as it looks! This combination of flavors and textures is incredible! Sweet and spicy combo is always magical (for another awesome recipe using this combination, check out my sweet & spicy baked chicken). And the added walnut crunch takes the sweet & hot to the whole new level! 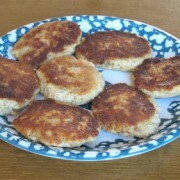 Best of all, this walnut salmon is extremely easy to make. When people see this impressive-looking fish, they’ll never guess that this recipe takes just 5 minutes of prep and the oven does all the work! 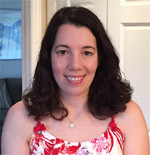 Want the recipes for the broccoli and sweet potatoes that I served with this salmon on my pictures? You’ve got it! Check out oven roasted broccoli and roasted sweet potatoes – they are super easy to make too! This dinner of salmon, broccoli and sweet potatoes is so healthy and delicious! 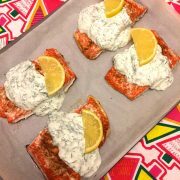 To make walnut crusted salmon, all you need to do is toss the ingredients of the walnut coating in a bowl, then slather on top of salmon and put salmon in the oven to bake. It doesn’t get any easier than that! 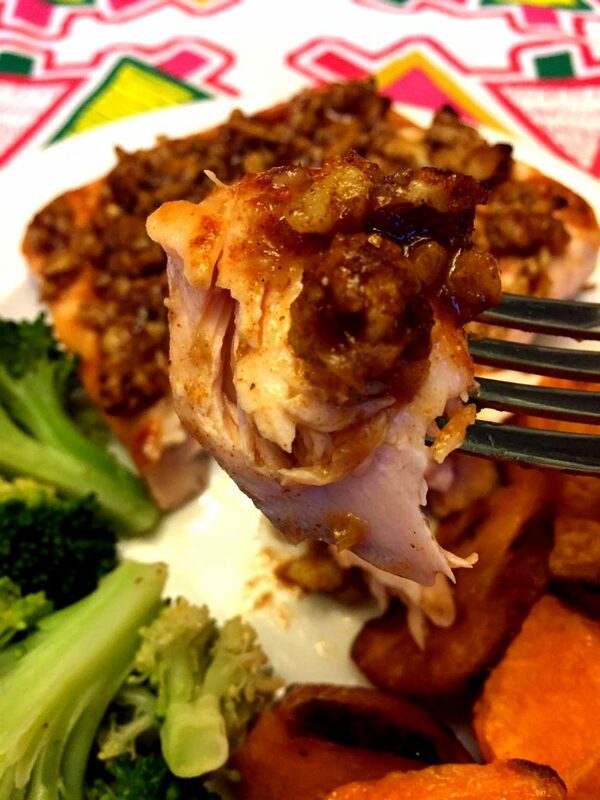 This recipe for walnut salmon uses just 4 simple ingredients – salmon fillets, walnuts, maple syrup and chili powder. 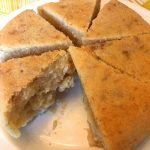 Super simple and super flavorful! 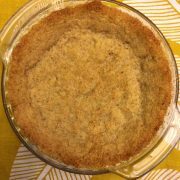 To make the coating, just toss chopped walnuts, maple syrup and chili powder in a bowl. 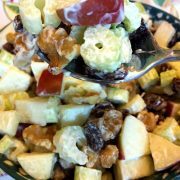 Tiny walnut pieces will be coated with maple syrup and chili powder – yummy yummy, you’ll want to steal a few walnut pieces right there and then 😉 Just don’t eat them all, otherwise they’ll be nothing left to put on top of salmon! 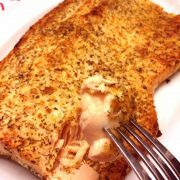 Parmesan Crusted Salmon – another awesome salmon recipe with baked salmon encased in Parmesan-garlic crust! 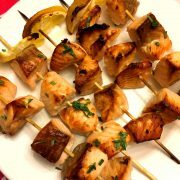 Baked Salmon Skewers – here’s a new twist on good ol’ salmon – make it in a kabob form! Salmon And Veggies Foil Packets – unwrap the foil packet and reveal a complete healthy meal! Maple Glazed Salmon – maple makes an amazing natural glaze, so sticky and finger-lickin’ good! Cajun Blackened Salmon – spice-rubbed blackened Cajun fish is so full of flavor, yum! This walnut crusted baked salmon is amazing! It looks so impressive and tastes mouthwatering! 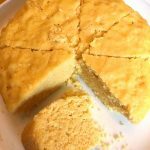 Best of all, it's virtually effortless to make - the oven does all the work! Preheat the oven to 400F. Line the baking sheet with parchment paper or foil. Put the salmon fillets on the baking sheet and sprinkle with salt and pepper. 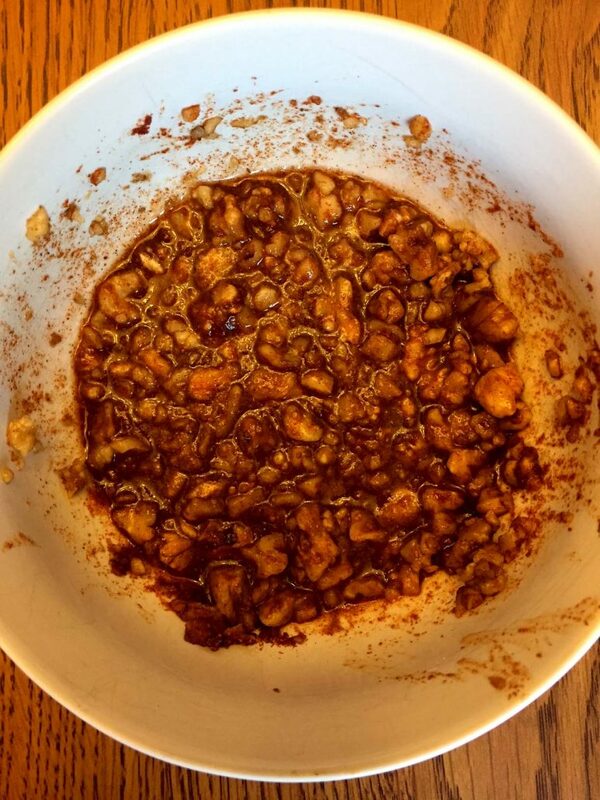 Put walnuts, chili powder and maple syrup in a cup and mix to combine. Spread the walnut mixture on top of the salmon. 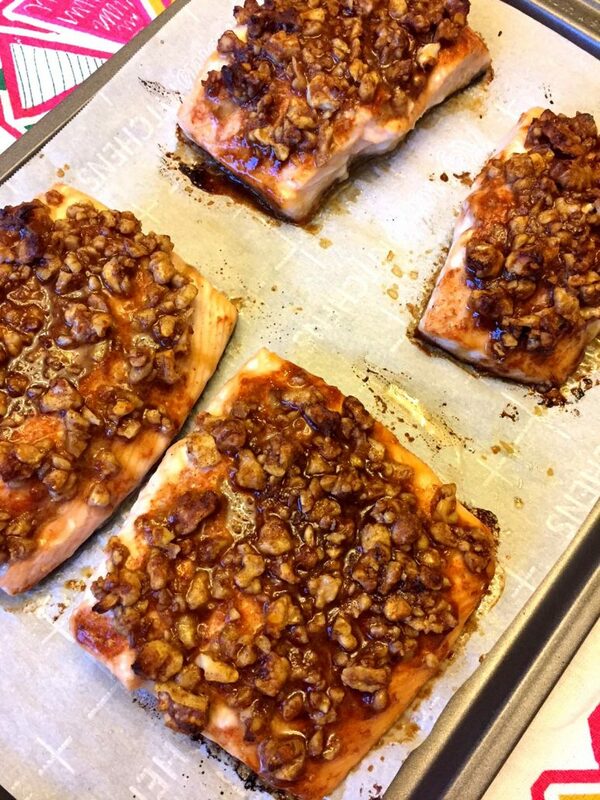 Put the walnut salmon in the oven and bake for 20 minutes.